Kohler, Wisconsin (CNN) - I like Whistling Straits, home of this week's PGA Championship. It's not just that it looks spectacular either. Nestled along the rugged shores of Lake Michigan here in the beautiful state of Wisconsin, it's a privilege to say this is actually my second visit to this part of the world. The course is about an hour's drive from Milwaukee where we're staying, and while it's quite a trek to get here it really is well worth it. It's not just that the people here are so warm and welcoming either. No, I think it's possibly something to do with the fact that, on seeing the course, I feel very much reminded of home. Home sweet home. My native UK. At first glance, it really does look like you're at a British Open, quite possibly in Scotland. That's just on the surface, though. I also like the fact that appearances can be deceptive. What do I mean by this? 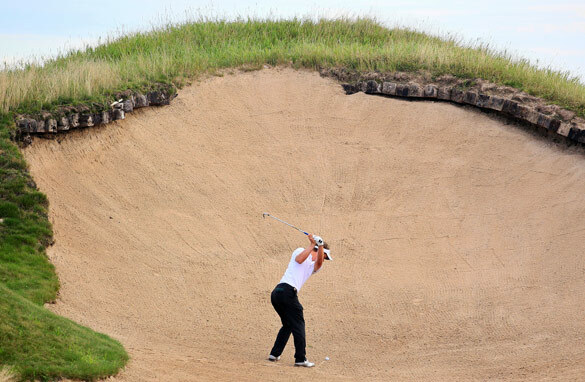 Well, I hope you weren't fooled into thinking the venue for this year's PGA Championship is simply a U.S. alternative to a British-style links course because it really isn't. I can't claim to have worked this out for myself, either. It was Phil Mickelson who first got me thinking about it when he said you you'd be wrong to treat this like a traditional coastal venue. "Lefty" told a packed press conference earlier this week that golfers just can't bump and run into the green like they might do at a St. Andrews or even a Royal Birkdale. The American stressed that the greens are too soft for that. Mickelson's views are shared by Northern Ireland's Rory McIlroy, who's hoping the week could end with him landing a first career major. To me, it's really quite incredible that Whistling Straits is already hosting its second major event, especially when you bear in mind it's only 12 years old and hosted its first such tournament when it was just six! While it's a fine sight when the sun's out and Lake Michigan is shimmering in the background, there's no doubt there are some negatives too. When it gets foggy here, it gets really foggy - and that can frustrate players, fans and media alike. Heavy rains and storms are forecast too through parts of the weekend, making an already tough challenge even harder. Vijay Singh triumphed here in 2004 and as of right now I'm still standing my prediction this time around it will be South Africa's Ernie Els who tastes glory at this most eye-catching of venues. Wish I could see how beautiful. That picture is 80% sand. The Golf announcers keep babying Tiger. It's Tiger this and Tiger that. I want to hear and see about all of the players. They get up close and personal with Tiger but not the others. I've seen enough of TIGER! Please...please let the world get to know some of the other players. Tiger is just a spoiled rotten philanderer. No interest in him at all. Its quite A nice course to see but being their is an ordeal because they always runout of any liqidsand more people forget to drink and get sent to the hospital with heat stroke. But anyway if you do just remember to drink lots. I should know i live 5 min. away. Exchange the long grass and heather for fijnbos and you are looking at Piinnacle Point in South Africa (home of Louis Oosthuizen)..... Same story, soft greens, no trees, many bunkers and a new course (6 years old) with seven holes along the ocean.... except at Pinnacle Point you can also see the whales and schools of dolphins from 9 T-boxes when you are lucky!